It is three weeks until we will be in London for our big family trip. I am starting to get really excited to go and just have that experience with Erik and the kids. I am researching places to go and see, trying to think about what will appeal to the kids, and find places for us to stay. I have a few friends who live in England who have given great tips and ideas. My sister just went there a few weeks ago. And I have my past trips to London to draw on. I sometimes wonder how we planned our travel before the internet? It makes the world come together and seem so accessible. I am trying to not feel stress associated with the trip, just soaking in the joy of being able to go. We have all worked really hard to earn the money for the trip. So many blessings, large and small, have come together to help us pay for it. I am feeling grateful, excited, and curious to see what adventures are ahead for us in London and Paris. What can you do for just one penny these days? After swimming, I took Robin with me to get the car washed, inside and out. Always good to do after a road trip. 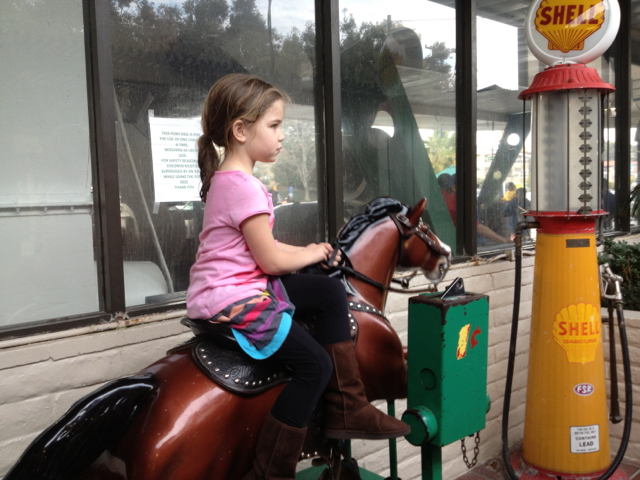 At the car wash, there is an old horse to ride for one penny. The car wash even provides the pennies, in case you don’t have any. 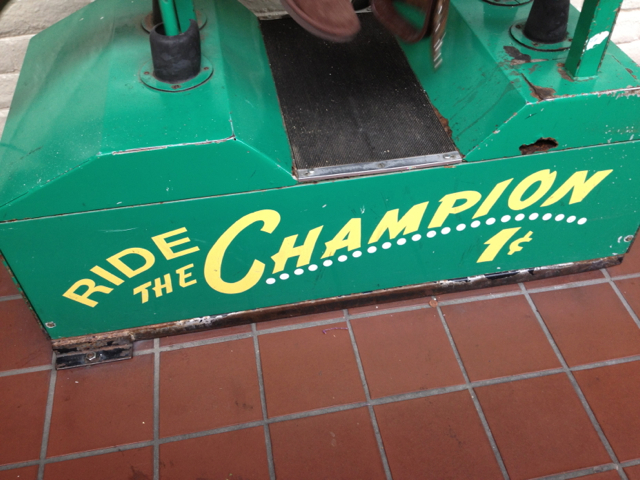 Some of us have an easier time of finding the joy in life and embracing the fun. I learn a lot from my kids who do that. Robin just has a joyful spirit and enjoys having fun. 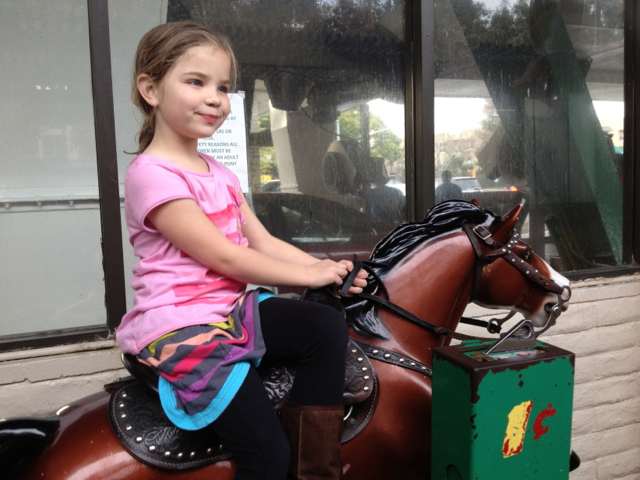 One ride wasn’t quite enough, so she grabbed another penny and rode again. It is nice to grab a hold of fun moments along the way to keep us smiling. After that, she enjoyed free popcorn and lemonade. I saw a mother of one of Nicole’s best friends and had a great conversation about the end of high school and college coming up. For just a penny, we had some fun and connected with friends. This past fall I have had more time for reflection and contemplation than in the previous 18 years of my life. After raising five kids for the past 17 ½ years, now that all of them are in school all day I have found more time to deeply think and be still in my thoughts. Each day I have noticed how unity and connection bring me the most joy and happiness in my life. Usually this is in the small interactions I have or decisions I make, or the small moments of joy and connection I have with the people in my life. When there is a lack of unity or connection with people, my life isn’t as full of joy. For the past few years I have started my day with a certain kind of breakfast following my morning exercise. It starts with some whole-grain cereal, a handful of granola, and some blueberries on top. Pour on some milk, and it is my perfect breakfast. In fact, having that final touch with the blueberries on my cereal actually gives me a great sense of happiness. It puts a smile on my face and feels good to my body to have this particular breakfast. Blueberries in the morning bring joy and satisfaction to me personally. This blog will be an exploration of finding unity in nature and relationships, connection and happiness with myself, and more joy and unity in my family and relationships with my friends, family, and everyone I meet. Studies show that things we do every day have more of an impact on us than things we do once in awhile. I will try and post pictures and thoughts each day to try and better understand how I am experiencing more joy and connection in my life, and explore how to feel it more often and find the deeper connections that make life complete and whole.